Finally we begin to see the fruits of our hard work. CKS: Internet-Extranet Edition (CKS:IEE) has been launched in pre-beta version, with the most of the Forms-Based Authentication (FBA) up and running. I worked on a few webparts (Change & Recover Password), ULS logging module and user import feature (which will be added really soon). I’ll soon post some screenshots and walkthroughs. Another undocumented piece of SharePoint. Finally, it was just a matter of inserting a custom function named PreSaveAction in a <SCRIPT> block of the NewForm.aspx (and EditForm.aspx). I also used the date parse code from this forum. 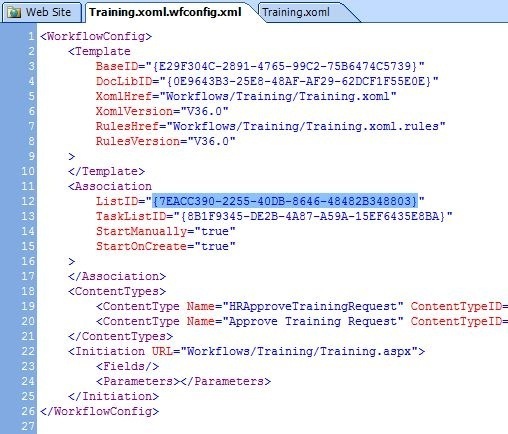 One of the main drawbacks of SharePoint Designer-based workflows is that you cannot reuse an existing workflow in another list. Recently, I accidentaly broke the list functionality editing the forms in SharePoint Designer. I had no way back except deleting and recreating the list. However, my pretty big SPD workflow would be lost…..
Well, not exactly. I took careful notice of the existing list GUID and the new list GUID. Then, I opened the XOML workflow file in text mode (see below). I then replaced all the ocurrences of the old list GUID with the new list GUID. I did the same for the wfconfig.xml file. And, it worked! My old workflow works flawlessly assigned to the new list. Of course, the fields that your workflow uses must keep the same name in the new list.